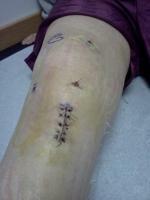 I had surgery in May of '07 to repair chronic subluxation of the peroneal tendon-the retinaculum repair. I played a season of club soccer (about 2 practices and one game per week), after being cleared, during the fall of '07, then high school varsity soccer in the spring of ’08 with very little pain most of the time. If my ankle was sore, the pain disappeared within an hour or two after I iced my ankle down and relaxed. This fall ('08) I played D3 college soccer and spent 3 months limping around campus. I didn't do anything to it out of the ordinary that I remember. The pain was mostly along the outer side of my ankle, dipping around and in front of my outer ankle and up my leg when it was worse than the "norm" for me during the season. The doctors (clinic dr at school and my ortho) haven't found anything in the MRI or X-Ray and can't really give me an answer to why I was in so much pain during our season. It only swells if it is really sore, and then only around the outsides of my ankle. The strength is good when its not very sore. Also, my balance is decent when I'm not too sore, but when it hurts I can make the most basic extensions that the college's athletic trainers would have me do (like the three point extensions). pins and needles around my scar (along the outside, back edge of my ankle bone) and on the top of my foot if it is lightly tapped. Outside of the season, my pain is considerable less. Its two weeks post season and I have pain biking (escalating as I move to more strenuous activities), climbing stairs, walking in unsupportive shoes, as well as putting it in odd positions (like turning it under the bed covers or sitting indian-style or keeping it at a small angle) but it is negligible after a little rest as compared to the constant high level of pain during the season. When the doctors check it out, it doesn't really hurt as they do strength tests ("push against my hand" stuff) or other examining bits, but I really feel it about 10 minutes after they're done. The doctors think maybe there is some nerve involvement, irritated scar tissue, or just that it will improve as I get farther from the surgery. They want to see what happens next season (9 months from now) before they try to figure out anything more. I, on the other hand, want answers or at least something to try because this is impacting my life and decisions I make and is, quite frankly, annoying considering I was told that I should be good as new after the surgery and the PT. I'm willing to try anything safe if it means I might not have to give up playing!